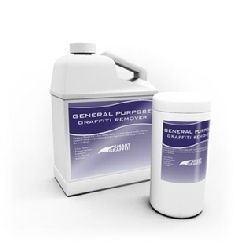 GENERAL PURPOSE WIPES GRAFFITI REMOVER is mild yet fast acting and reduces the time it takes to remove graffiti considerably. It is designed to be used on a regular basis to remove: crayon, correction fluid, permanent marker, pen ink and pencil and is easy-to-use leaving no damage to the original underlying surface. General Purpose Wipes can remove graffiti from: white boards, desks, cupboards, filing cabinets, lockers and walls. It is safe to use as it does not cause damage to these surfaces when applied correctly. Packaged in a handy tub it gets to work on graffiti within seconds. It saves significant time and labour meaning you can often get 2, 3 even 4 times as many graffiti removal jobs done in the same amount of time.